Upon arrival in Delhi airport, you will be picked up and transferred to your pre booked hotel. Check in at the hotel; rest of the day is at leisure. Overnight stay at the hotel. 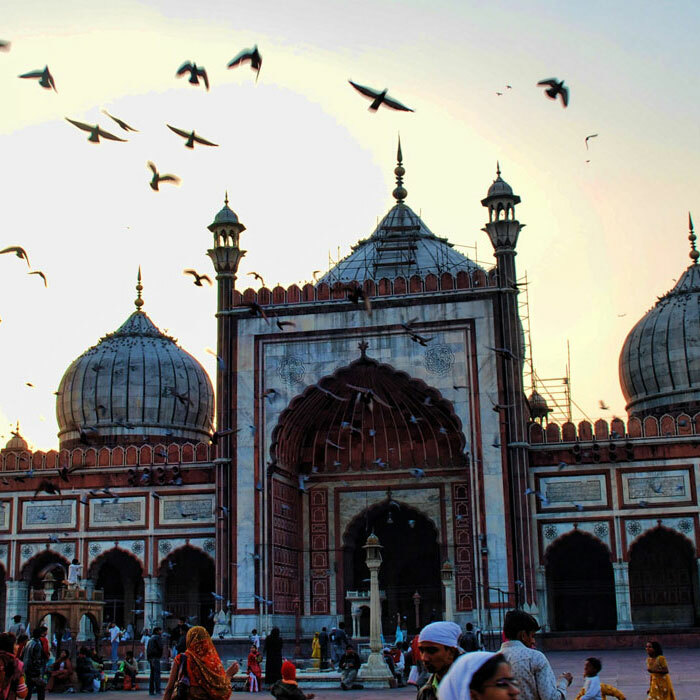 After breakfast go on a sightseeing tour of the historic city of Old Delhi. Visit the majestic Red Fort, a marvel in red sandstone, Jama Masjid- the largest mosque in India both built by emperor Shah Jahan of Taj Mahal fame and Rajghat – memorial of Mahatma Gandhi. Go on a rickshaw ride through the silver street in Chandani Chowk. Sightseeing of New Delhi include Rashtrapati Bhawan, one-time imperial residence of the British viceroys; the India Gate, a memorial raised in honour of the Indian soldiers martyred during the Afghan war; the Laxmi Narayan Temple, built by the Birlas, one of India’s leading industrial families; Humayun’s Tomb, lotus shaped Bhai’s Temple, Qutub Minar, built by Qutub-ud-din Aibek of the Slave Dynasty. In the evening go to the Light and Sound show at Red fort. In the morning, leave for Jaipur. Upon arrival in Jaipur, check in at your pre booked hotel. In the afternoon visit the local market. Today after breakfast, explore the Pink City with an excursion to the Amber Fort, situated just outside the city. Enjoy the experience of riding on an elephant back to and from the top of the hill on which the fort is situated. In the afternoon go on a sightseeing tour of the City Palace in the heart of Jaipur, known for its blend of Rajasthani and Mughal architecture. Not far away is the Central Museum. Jantar Mantar is the largest of the five observatories built by Sawai Jai Singh. The Hawa Mahal or the Palace of Winds was constructed for the royal ladies to watch the royal processions without being seen. All monuments are located in the vicinity of City Palace Complex of Jaipur. Later in the afternoon visit the famous markets of Textiles, Gems, Carpets, and Handicrafts. Jaipur is an ideal place for buying souvenirs. One can also visit Nahargarh Fort to see it illuminated over the floodlights. Return to the hotel for overnight stay. In the morning leave for Agra; enroute visit Fatehpur Sikri. Upon arrival in Agra check in at your pre booked hotel. Overnight stay at the hotel. Start your day early to witness the incomparable Taj Mahal with its spectacular view at the time of sunrise. Taj Mahal is an architectural modern day wonder of the world. It is a fine example of the fusion of many architectural styles. The tour continues with a visit to the Agra Fort which lies across the river Jamuna from where one can get the most moving view of the Taj from the little octagonal tower in the Agra Fort; follow this up with a visit to Pearl Mosque and the Tomb of Itamad-ud-Daula built by Empress Noorjehan in memory of her father. In the evening you may visit to the souvenir markets of Agra. A must-see place would be the Oswal Emporium where they have built a mini Taj Mahal inside their showroom and it took 10 years for the artists to complete the mini replica of the Taj. The show room conducts free sound & light show showing the eras of Taj Mahal. Overnight stay at the hotel in Agra. In the morning leave for Delhi; enroute visit Sikandra . Upon arrival in Delhi check in at your pre booked hotel. Overnight stay at the hotel. In the morning you will be transferred to the airport to board the flight for Cochin. Upon arrival in Cochin you are met and transferred to your hotel. Overnight stay at the hotel. In the morning go on a city tour of Cochin visiting Jewish synagogue – the oldest synagogue in the entire commonwealth, St. Francis Church, St. Mary’s Cathedral, Cochin Harbour Terminus, Chinese Fishing Nets and the Mattancherry Dutch Palace built by the Portuguese known for its murals depicting scenes from the Ramayana and the Mahabharata and dresses and palanquins used by Cochin’s erstwhile rulers. Post breakfast drive to Periyar (Thekkady), one of the most fascinating wild life sanctuaries in India, noted for elephants and scenic beauty. In the afternoon take a Jeep safari for an hour or two to see the outside of the Park. After breakfast, go on sightseeing tour visiting Periyar Wildlife Sanctuary- one of India’s biggest wildlife sanctuaries covering 777 sq. Km (300 Sq. miles).It is a Tiger Reserve with its centrepiece, the man-made Periyar Lake at the height of 2000 ft. covers 26 sq. km, running through the forests of the Western Ghats in Kerala. Animals found here include elephant, sambar, gaur and wild boars and birds like ibis and grey heron. The visit is done in a boat to view animals. With a bit of extra luck we may be able to see the rare tiger as well. Later in the evening take a tour of the spice plantation to see crops of cardamom, cinnamon, pepper, coffee, tea estates etc. On your way back to the hotel, you could stop at the local market and pick up some fragrant spices. In the morning leave for Kumarakom. Upon arrival in Kumarakom, check in at hotel/resort. Kumarakom – for the nature-lover. Here in this backwater town, you can laze in a canoe amidst sylvan surroundings where the only presence is yours and the egrets. Later visit the Kumarakom Bird Sanctuary, located on the banks of the Vembanad Lake, to see numerous species of birds, including Darters, Bitterns, Marsh Harries, Teals and several varieties of Herons roosts. For an avid bird watcher, it is always advisable to carry their binoculars at all times. Make sure you do not miss out on Karimeen and fresh toddy the favourite fresh water food and the local wine. Overnight stay at the hotel/resort. Full day is at leisure; enjoy the facilities at the resort. Overnight stay at the hotel. Today at 12 noon you will be transferred to Kumarakom Jetty to board the House boat. Cruise through the backwaters of Kerala; on the way you can see traditional Kerala village life .You will see merchants selling vegetables in a boat while the village people await at the banks of the Vembanad Lake. Here your crew will prepare delicious Keralian meals from freshly bought vegetables from the market. Overnight stay at the houseboat. Check out at 10 00 clock and proceed to Kovalam. Upon arrival in Kovalam, check in at the hotel/resort. Overnight stay at the resort. After breakfast, full day is at leisure at the beach resort. On this day you are transferred to Trivandrum airport to board flight for your onward journey.